Today I'm bringing you The Capitol Collection from Cover Girl. Set to release with the Hunger Games Catching Fire this collection contains 9 sparkling shades inspired by the film. I picked this set up on clearance at my local Walgreens but have come across them still at full price in K-mart and Target so you should still be able to find them. 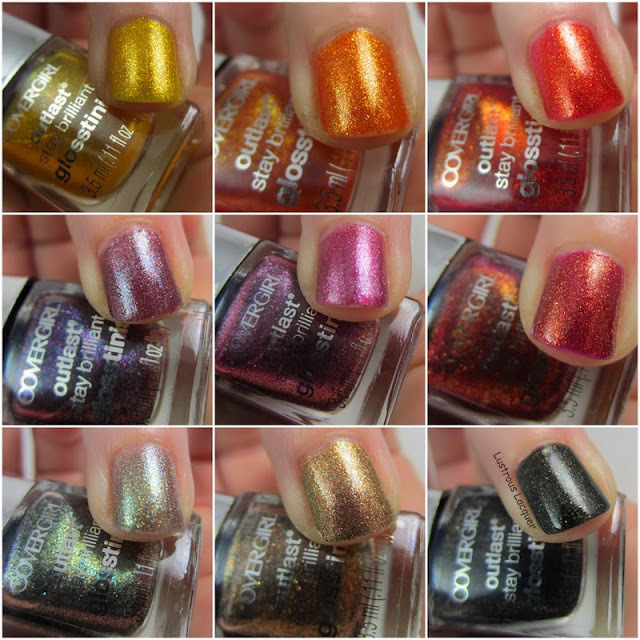 Cover Girl Outlast Glosstinis are 5-Free and come in a mini version of the full-size square bottle. Thankfully, the mini size doesn’t mean a mini brush. The same round, short, medium width brush I've come to love from the full-size version made it to the mini bottles, with a shorter stem of course. The application was consistent throughout the collection with an easy flow that allows for complete control. The surprising thing for me was that as the shades got darker, the polish got sheerer. Several polishes appeared streaky with the first coat but leveled out nicely with the second. And these polishes are buildable, giving nice, even coverage with 2-3 coats depending on color. Sulfur Blaze is a deep yellow with golden micro shimmer. The pigmentation with this one caught me off guard. I was expecting a very sheer polish that needed 4 or 5 coats. Shown here is 2 coats without top coat. As you can see with 2 coats I still have VNL and a 3rd was needed for full opacity. Normally I'm not a fan of yellow polish on myself but this one seems to have just the right hue to it for my complexion. This vibrant orange caught my eye in the store months before I picked it up. Although not the most flattering color on me I'm still glad I picked this one up. I can see using it in tons of nail art. Including one of those flame manicures, I see so many people wearing. Rouge Red is an orange toned red polish with gold micro-shimmer. Again application was smooth with more pigment than I was expecting. Rogue Red looked redder on the nails than it does in the bottle and was extremely hard to photograph accurately. The golden shimmer kept making it look orange instead of red. You don't want to skip the base coat with this one as it's a stainer. Inferno is a deep magenta color with intense golden micro shimmer. Application with this one was a little patchy with the first coat. Here I've shown it in 2 coats without top coat. Did I mention that it had intense micro shimmer? Just look at that illumination on the nail! Surprisingly there was no staining with Inferno. Pyro Pink is a deep pink leaning purple with silver micro shimmer. This one was pretty sheer with the first coat but built up nicely after 2. With with the sheerness this polish had it still flowed nicely onto the nail, with complete control as to where the polish went. Violet Flicker is a deep purple with light purple and teal micro-shimmer. Sheer on the first coat full opacity was reached with 2. I think the shade is just a bit to muddled of a purple for me. It's not a bad color by any means, it's just not for me. Seared Bronze is an olive green polish with purple and green micro shimmer. Sheer on the first coat, full opacity was reached in 2. Again I've shown this polish without top coat. Like Violet Flicker this isn't a color that I would normally wear on it's own, but I think it will make a great accent nail. The micro shimmer leans so many different ways when the light hit it that it will go with a lot of other polishes. Looking at it up close, it reminds me of Christmas colors without being obviously Christmas. I hope that makes sense. Scalding Emerald is a dark green with blue and gold micro shimmer. Even sheerer that Seared Bronze on the first coat, only 2 were needed to reach full opacity. Show here is 2 coats without top coat. I actually like this color, and can see myself wearing it a lot in the fall and winter months. Black Heat is a black polish with gold and red micro shimmer. Being the sheerest of the collection application was extremely streaky on the first coat. Shown here is 2 coats without top coat. With the addition of the golden shimmer this polish almost looks to be a dark forestry green instead of black. As you can see in this macro shot the base is indeed black and almost looks to have a glass fleck appearance to it. I like this polish, but I don't usually wear black polish, so I don't see myself wearing this one very often. These look great! I like some of the colors too. Rouge Red is my favorite! I almost put it on tonight for my pedicure but decided to go with something a little less flashy for a wedding Im attending tomorrow. I loved those macro shots. Im working at taking better ones but these turned out the best so far. Now I need to work on getting my hand in the same position every time. I have a couple of these, but they just aren't my "thing" I guess, as I never wear them. However, they all look great on you, especially the orange and red! Your swatch is actually making me want the red, might have to hunt it down. I think it would be awesome on toes! I actually looked at these in the store several times before I picked them up. I originally only wanted the yellow, orange, and red to do a flames manicure but when I found them on clearance I decided to get the whole collection. lol ok ok I got the hint. I've got a nail art challenge that starts this week that will take up the rest of my posts, but I could work on that gradient for next week. Inferno and Pyro Heat look really pretty. And I agree that Violet Flicker is too muddy looking. I never paid much attention to the collection in stores but your swatches are lovely. Awe thank you! I've been working on getting better pictures. It's nice to hear that people are noticing.